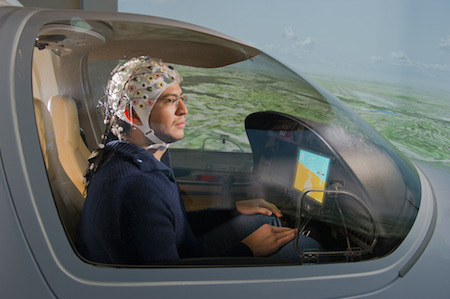 Future aviators could pilot planes by just thinking. This according to scientists at the Institute for Flight System Dynamics at Technische Universität München (TUM) and Technische Universität Berlin (TU Berlin). The system uses electroencephalography (EEG) to detect brain waves. An algorithm developed by scientists from Team PhyPA (Physiological Parameters for Adaptation) at TU Berlin deciphers electrical potentials and converts them into control commands. One of the subjects was able to follow eight out of ten target headings with a deviation of only 10 degrees,” reports Fricke. Several of the subjects also managed the landing approach under poor visibility. One test pilot even landed within only few meters of the centerline. Future-oriented movie-going sf fans of course recall the Firefox, a thought-controlled fighter plane developed by the Russians, and stolen by Clint Eastwood, in the 1982 movie Firefox.